The combination of chocolate and peanut butter is irresistible to me, and I just love getting both flavors in one cookie. There are endless ways to put these two doughs together, and I’ll show you a few, but I’m sure you will come up with some fun ideas of your own. Yes, you’ll have to make two different batches of cookie dough, but it really is a very easy dough to make, and it won’t take you long at all. If you’re wondering how many this will make, I just don’t know what to tell you. It depends on whether you’re making the three layer cookies or the chain cookies or . . .
Let’s just say it makes a generous amount, at least 4 dozen. Two easy batches of shortbread cookie dough can be combined in countless ways to make creative and delicious cookies. In a large mixing bowl (a sturdy stand mixer is best) beat butter, peanut butter, egg yolk, vanilla, and milk (or water) together well. Add the powdered sugar and cornstarch and beat on low until incorporated. Gradually add the flour. This is a very stiff dough! It will appear crumbly, but with thorough beating, should come together. If it doesn't, drizzle in a small amount of milk or water. Wrap and refrigerate dough. Scrape bowl out and use for the chocolate dough. In large bowl, beat butter, egg yolk, vanilla, and water (or coffee) together well. Combine the flour and cocoa and gradually add, mixing until dough forms. 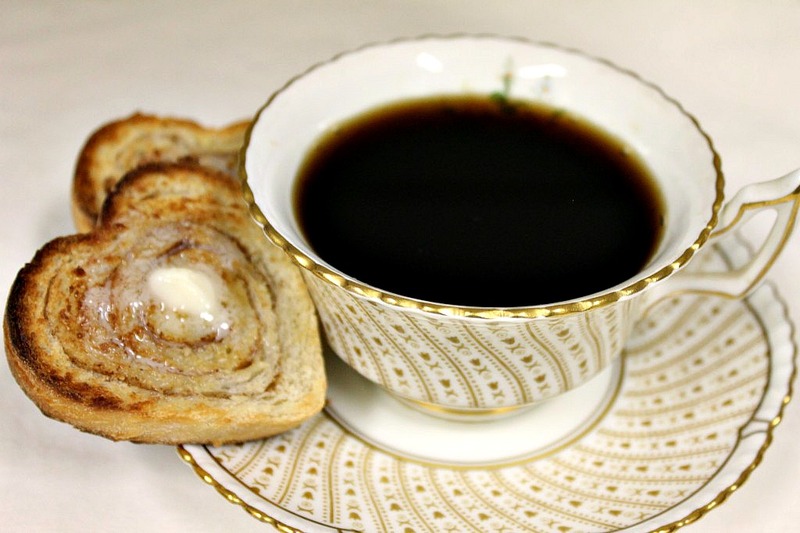 If necessary, drizzle in a very small amount of water or coffee. Wrap and refrigerate both doughs for 30 minutes. If you refrigerate the dough longer, it will become very stiff. If that happens, let it rest at room temperature until manageable. Try using two different sizes of the same shape of cutter. If using hearts, cut large hearts out of both doughs, then use a smaller heart cutter in the center of half of the large hearts. Gently press a shape with the center removed onto a solid shape. Once baked, fill the center with chocolate ganache or peanut butter icing. You can also marble the colors, roll, and cut. Or try putting a small heart on a large one, topping with a dab of peanut butter, and covering with another large heart, creating a small raised heart in the center. 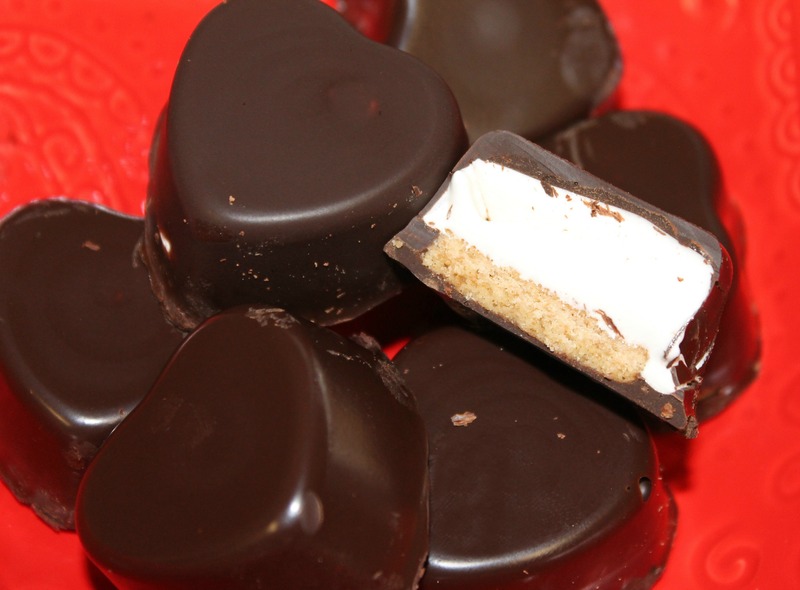 Cover cooled cookie with icing or ganache. Or cut small hearts out of the center of large hearts to create heart "frames". cut one on the side, and slip the other through the cut. Press lighlty for a 2 heart "chain". A layer of peanut butter dough, a small chocolate heart, a dollop of peanut butter, and top with another layer of peanut butter dough. Or reverse the colors. See? This one was chocolate, a small peanut butter center, peanut butter, and chocolate. So many ways to play with this dough, and I’ll bet if you have littles in the kitchen, they will get very creative! This is it for Valentine’s Day recipes for the year, and you know what that means, right? Everything green is coming your way soon. Leave it plain for a pretty hanging cookie. These tender little sugar cookies with bits of chocolate and maraschino cherries will delight anyone with a sweet tooth. 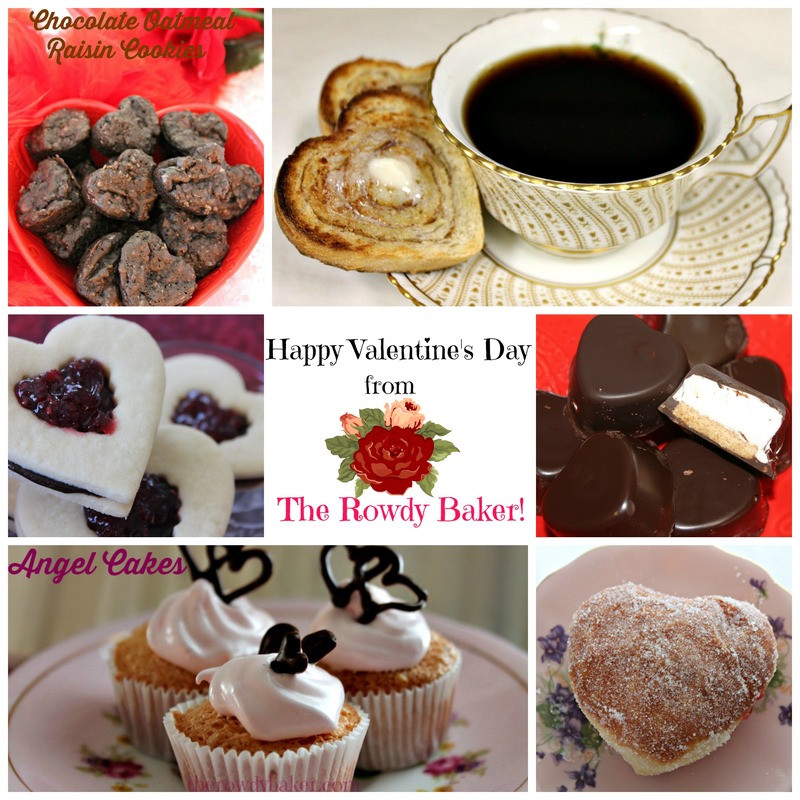 Surprise co-workers, friends, and loved ones with homemade Valentine treats! They’re versatile! Decorate with chocolate, use a special heart-shaped “cup hanger” cutter, make little two-bite hearts with chocolate centers or write names on larger hearts.Add color for a hot pink Valentine effect, or let the cherries give them just a hint of peachy pink. Drizzle or dip – chocolate is always a good choice! Make a dainty hot pink cookie to go with a cup of tea. I often use a variation on my basic shortbread cookie because I love the texture – and because the recipe is EASY! They are a little fragile though, so make sure they’re cooked long enough (too soft and they’ll break, but bake them too long and the pink will turn an unattractive color) and handle and transport them with care. This makes a lot of cookes – 6 dozen. The baked cookies freeze well, or you can always freeze the cut out shapes between layers of parchment in a zipper bag. Or you can just eat them with abandon! In a large bowl, combine powdered sugar and butter. Beat until light and fluffy. Add the chocolate chips, cherries, flour, salt and cornstarch. Stir just until the mixture forms a smooth dough. Dough will be stiff! If you have a sturdy dough hook, let it do the work. If not, you might have to knead it together by hand. Roll out the dough to about ¼ inch thick between sheets of lightly floured parchment. Cut with cookie cutters of your choice. Place 1 inch apart on ungreased cookie sheet and bake 11-12 minutes, The bottom edges should just be turning golden brown. Watch the cookies carefully - if they get too dark the pink will turn an unattractive orange color! Move cookie sheet to a rack to cool for 1 to 2 minutes, then slide cookies onto rack to cool completely. Your choice: natural or hot pink! Chop and lightly blot cherries. Beat the butter and powdered sugar until fluffy. Add chips, cherries, and dry ingredients. Use a dough hook or lots of muscle! Roll and cut into your favorite shapes. Well, this is officially my last Valentine’s post of the year. I still have half a gallon of cherries – which means I either need to freeze them or eat them. Hmmmm……freeze or eat? Freeze or eat? Well, that was a no-brainer, wasn’t it? Here are those wonderful recipes I told you about. Crumbs in My Mustachio created a “Tiramisu Cheesecake”, Moore or Less Cooking Blog brought “Fudgy Cherry Cheesecake Brownie Bars”, and Tampa Cake Girl baked an “I Love Chocolate Cake”. Hope you’ll stop by and visit their blogs! With a soft, chewy texture that lies somewhere between a cookie and a brownie, this explosion of dark chocolate and maraschino cherry will satisfy you right down to your toes. 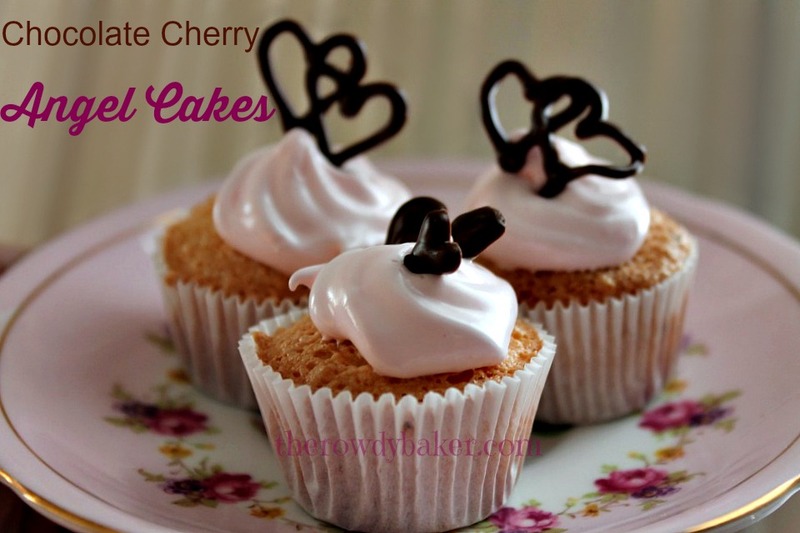 And yes, I get a little bit passionate about cherries! The Rowdy Baker loves her some cherries! 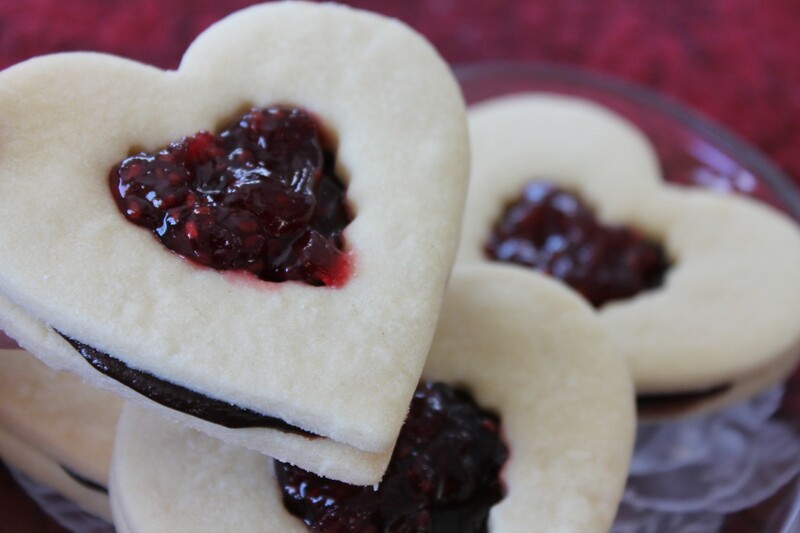 This recipe is a little fussier than a normal cookie recipe – more ingredients, a few extra steps – but it’s well worth the effort, especially for a holiday like Valentine’s Day. 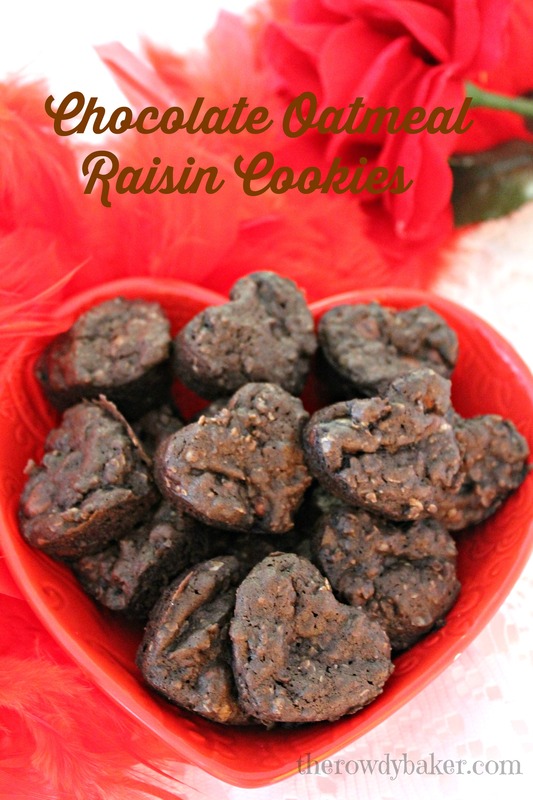 Makes 4-5 dozen These cookies get softer and more flavorful after 24 hours! In a medium pan, melt butter and unsweetened chocolate together on low heat. Stir frequently. When chocolate is completely melted, remove from heat and stir. Add white sugar and brown sugar to the butter mixture and stir well. Add vanilla and buttermilk, stirring until combined. Put mixture into a large bowl. Add eggs and beat on medium speed for 1 minute. Add flour, baking powder, baking soda, and salt, and mix just until dry ingredients are incorporated. Add chocolate chips, walnuts, and chopped cherries. With cookie scoop or by rounded tablespoon, drop dough at least 1 inch apart on prepared baking sheet. (Don't chill this dough. Bake the cookies right away, or scoop onto baking sheets and freeze for later. )3-4 minutes before moving to the rack to cool completely. Ice and decorate cookies. Note: Bake these right away. If you let the dough sit too long or put it in the fridge, it will set up like soft fudge! If you don’t want to bake them all, I suggest scooping the dough onto baking sheets and freezing for later. Melt the butter and chocolate. Add the sugars and stir like crazy! Stirring in the chocolate chips, nuts, and cherries. Scoop onto prepared baking sheet – parchment for this batch. And now, for the icing! Gently melt the chocolate and cream (and maybe a little cherry juice) for the icing. Whisk in the powdered sugar until it’s velvety smooth. Dollop (best for cherries) or spread (best for sprinkles) the icing. Admire your creations before they disappear! Here’s another idea: Buy some glass candle holders from the dollar store and serve individual cookies at each place setting. Pretty classy, huh? So many cherries, so little time. I’m not sure why I bought a gallon of the things…guess I forgot the advice to “never shop hungry”!